What’s going on with Oakland’s budget? Oakland Unified School District (OUSD) has a long history of financial problems, including plunging into state receivership in 2003 and, more recently, mid-year budget freezes and cuts. Turnover at the leadership level, chronic overspending in the areas of special education, early childhood education, and nutrition services, and a lack of transparency and clarity in OUSD’s budget practices compound these problems, creating an unpredictable and distrustful situation for teachers, principals, and families alike. How has this actually impacted teachers? After the unexpected budget freeze last year, and mid year cuts this school year, the reality of not having necessities such as pens, pencils, paper, and books is fresh and still negatively impacting classrooms across the district. Teachers are spending extra hours and PD sessions raising funds for projects and trips. School leaders are again having to make tough decisions around personnel, extracurricular and after school programs, academic support in classes, and SEL services, such as Wellness Centers and counseling critical to populations that suffer from high rates of trauma and poverty. In short, this year’s budget cuts have once again put schools in survival mode, distracting from the critical work that needs to be done to create thriving learning communities. Despite the strength and resilience of Oakland educators, this year’s budget cuts are making everyone’s job harder–from the bottom to the top–and students continue to pay for the district’s financial mismanagement. However, not all students are paying equally. Each district run school experienced a different level of cuts, and some schools have access to resources that can soften the blow. Charter schools, though not immune from the fiscal problems of the district, benefit from autonomy and flexibility in their spending–a fact that raises tension and even animosity between the two camps. 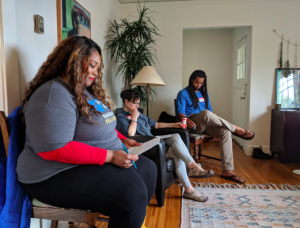 There is absolutely work to be done to ensure equity among district and charter schools in Oakland, which is why the 1Oakland Campaign is seeking to understand, discuss, and address disparities in enrollment and outcomes. 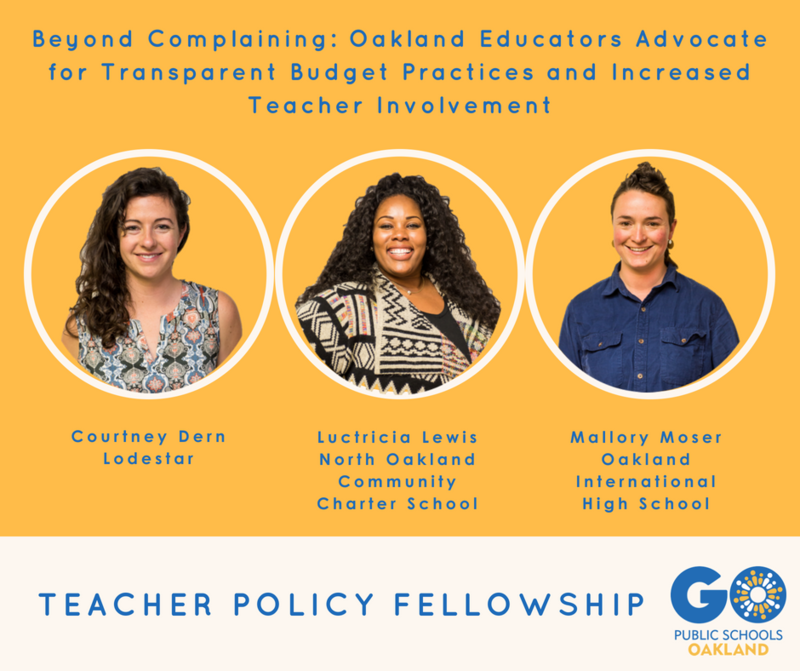 As GO Oakland Teacher Policy Fellows, we chose to be involved in this campaign in order to improve the long-term financial health of OUSD, while avoiding state receivership in the near-term. Since the news of mid-year cuts last fall, many other teachers, students groups, school leaders, parents, and community members have been vocal in demanding no more cuts to school sites. In order for this to happen, OUSD needs a framework and sound decision making processes to address the long-standing financial woes that affect our classrooms every day. What have we done about it so far? As GO Teacher Policy Fellows, we spent the last year educating ourselves about specific challenges facing Oakland and in that learning we discovered that there are national best practices in district level budgeting developed by the Government Finance Officers Association (GFOA) called the Smarter School Spending Framework. We advocated for the implementation of the framework. 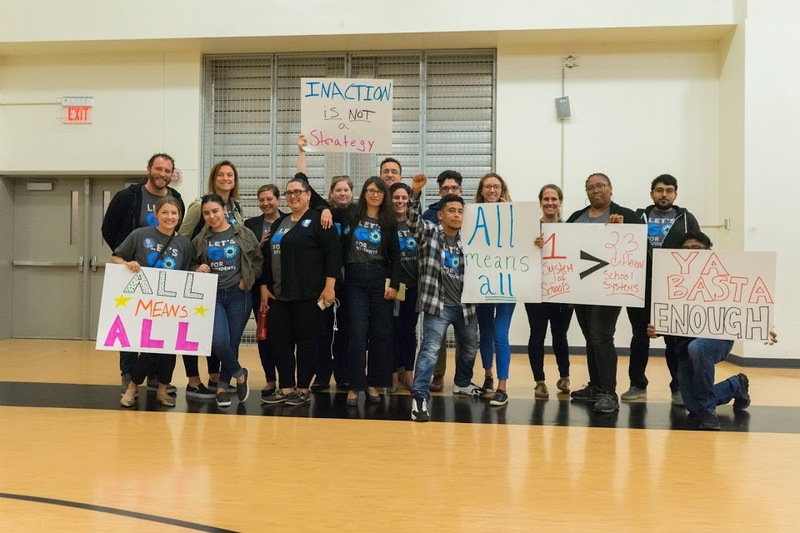 On March 28, we attended OUSD’s school board meeting to advocate the passing of a resolution that will implement the Smarter School Spending Framework. We believe that the GFOA framework will help put the district on track to long-term sustainability, ending the need for these mid-year cuts and freezes that are hurting our schools. 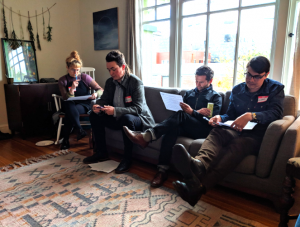 We believe in the importance of informed, empowered educators so we hosted a house party to bring together teachers from both charter and district schools in order to discuss the current state of the budget and to engage in a conversation around ideas to involve and inform more teachers. Educators shared a variety of perspectives and ideas regarding the current shifts and changes within the OUSD budget, as well as thoughts and feelings about the best way to budget for impact so that children are held at the center of financial decisions. We will continue to learn about the budget–and share those findings with fellow educators so that we can change the narrative from teachers who simply complain without providing solutions, to teachers who intelligently advocate for budget decisions that positively impact Oakland’s students and families. You can sign up for GO’s Budget newsletter to stay up-to-date on the latest news from the district. We invite you to join us at the Teacher Policy Fellowship Call to Action event on May 31. RSVP here for a night of celebration and action on behalf of Oakland students! Light dinner provided and childcare available.